"It was you whom the Lord used to raise up many people in this healing move of God, of whom I am one! Thank you for being faithful to the Word and for training me! 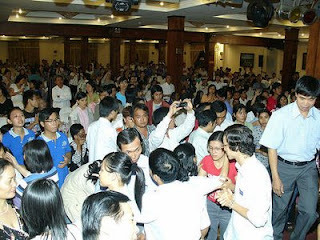 There were many cases of asthma, heart disease, liver, stroke, some kind of brain cancer healed. Three cases of deaf ears opened. 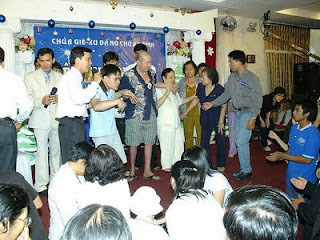 A few cases with spine problems healed, three or more cases involving people who could walk again after not being able to walk well beforehand...I forgot what else. I watched the DVD to get a better look at what happened, for it happened so fast. Around 100 souls were saved. We contacted some after the event, connecting them to pastors of local churches near where they are living. Some are now worshiping with believers. Even before the Crusade, the pre-event people did a good job, and reportedly from just two staff people, we had at least 35 converts out in the streets as they went out giving the Jesus' film and ministering to the infirm. Strangers heard about these people who were being healed in the streets, hospitals, market places screaming happily because they were healed, and the strangers themselves came asking to be ministered to, and they accepted Jesus. A few of our staff people are still out there in hospitals and the streets as the Holy Spirit leads them, ministering to the sick and saving the lost for Jesus. This morning they SMS-ed me informing me that three souls were saved. 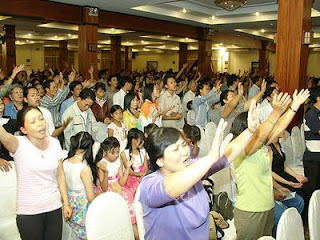 What a work that is going on here in Vietnam…HALLELUJAH!!!" However, listen to this great news. A Christian doctor who was a skeptic used to mock this kind of healing thing as fake, set up by Christians. For some reason he was there (quite a few people for "some reason" were there, some even reluctantly, yet were healed). So this doctor was there---and he was HIV positive. After that night, he got home and tested himself as he is a doctor. The result of his test was NEGATIVE. God is so merciful. And so GREAT!" I want to publicly thank our Lord Jesus and his humble servant, William Lau of www.theelijahchallenge.org, for discipling us at Open Air Seattle in the use and excercising of His authority given to us (and all obeyers of the Great Commission) by Jesus "to heal the sick, cast out demons, cleanse the lepers, and raise the dead" in the context of preaching and evangelism of the lost OUTSIDE of the "boat", i. e., the Church. I now wish to publish what Jesus did through me today in Federal Way, Washington at around 1:30 PM PST. There was a humanitarian outreach to the homeless at a church across the street from a wooded "forest" used by 40 or 50 homeless folks. Thadeus and I were there making ourselves 'available' to see what God would do through us at this free lunch outreach. After the folks were fed lunch, and given used clothing for the winter, things were winding down, and I was getting antsy...so I INITIATED what you are know about to read! I told her I wasn't going to close my eyes and 'pray' for God to heal her, but rather I would take authority over her infirmities and command healing in Jesus' Name with my eyes open! I asked her permission to touch her (fore)head and minister healing to her. She said "yes," so I proceeded. Seven or eight seconds later, I stepped back and asked her what happened. She was speechless! I asked her to check her pain level. "If it was '10' before, what was it now?" She said "There's no more pain!" I said---not anticipating such outstanding results so soon---"Is it at a one, a two...a what?" She checked again and said "I feel fine!" I took her hand and asked her to get up out of the couch in which she was sitting. She stood excitedly and in wonderment. I said, "Praise Jesus! Why not tell someone here in the foyer what Jesus just did for you?" She said, "OK, yeah, thank you, Jesus!" She told Thadeus who had just returned from down the hallway. He added to the joy by testifying and showing Martha his healing received during The Elijah Challenge training last Wednesday at my house. His old hip fracture prevented his movements, but he showed her his healing by doing three or four deep knee bends, then he also testified to Jesus delivering him from (as of last Wednesday) cigarette nicotine addiction, and he was still "sober!" After things calmed down, I told Martha this would all be in vain if after she died she ended up in hell because of her sins against God and His Law. I offerred her some gospel tracts, so she took 6-7 to share with her friends in the woods across the street. Praise the Lord. Elijah has returned to prepare the way of the coming of Jesus to claim His Bride and judge the world in righteousness. O come quickly, but not too quickly---we've a lot of harvest to get in the Barn, but the laborers are few---still in their boats, waiting for the fish to jump into their boats, I guess, right? I was in Pittsburgh, PA, USA when the world crossed from the 20th Century to the 21st Century. At that time, the television programs were hot about Y2K. Everybody said that the world would go through a crisis similar to the End-time. Everything would collapse around us. The computer systems around the world would fail and so does every other system. However, nothing really serious happened. 2000 came and left us in a hurry. Since then, we were hit by many mega-calamities from 9-11 to Tsunami. From global warming to run-away weather patterns. Now we have made it to 2009 and I believe we are closer to the End Time than ever before. The natural world is convulsing and now the economic crisis spreads over the world like a dark sinister flood. Wars, poverty and a thousand other unreported calamities continue to plague us. For me and many other pastors, we know that this is not just the End Time but the End of the End Time. The hearts of many are troubled and they may not know how to deal with the new situations. This is the time, they need to know the hope that Jesus has provided. They need to know that this world is not their only home but that God has a better place for them. Therefore, we need to share the Gospel more intensely and let the world know that their Creator God loves them very much. And that their Father in Heaven does not want them to end up in the place of the devils. 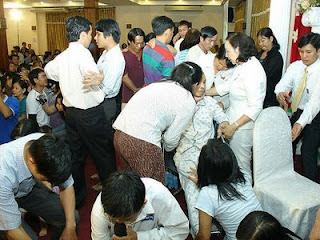 Souls are dying and we have to find ways to convince them that they need salvation provided by Jesus Christ. Elijah Challenge is just one of the many ways by which we can use to apply to this task. By showing the tangible power and authority of Jesus to heal the infirm and thus prove that Jesus is real and alive. Those who have been trained during the Elijah Challenge training seminars, we encourage you to use all that God has given you to heal the infirm and preach the Gospel. "Power Evangelism" is needed because the present society is more skeptical about the reality of God. People need to know that what they believe is the Truth. Please pray for our Founders and Directors, Pastor William and Pastor Lucille Lau, as they serve God from their base in Houston. Please pray also for all the Elijah Challenge coordinators from your area and around the world. kindly pray for me and Sister Grace as we continue to minister from Kuala Lumpur. We promise to pray for all of you, our precious Elijah Challengers as you move mightily in the name of Jesus and win many souls. The priority of the New Year is winning souls. God bless and please have a very happy and fruitful New Year. May you win many souls to the kingdom of God.